We are confident that you will enjoy a facility that is light, clean, and uncluttered. A training environment that is noncompetitive, focused, and fun. As well as a teaching staff that is friendly, enthusiastic, and encouraging. Try a class at no charge! We value commitment and loyalty so can't take students training elsewhere. Our monthly membership is the lowest for a full featured dojo on the Central Coast, just $80 for unlimited classes. ​We have no annual contracts or registration fees, and our periodic promotion fees are modest. We start each class together in a circle followed by a simple bow of mutual respect. Unlike 99% of dojo's we have no Shinto shrines (kamiza) or attunement rituals (hakushu). While our staff are members of the body of Christ we heartily welcome and currently teach good people from other faiths, and none at all. Our experience has proven that learning to handle multiple attackers (randori) is a practical necessity that can not be left until black belt. Beginners and black belts alike love this practice for it's ability to help you think clearly and act decisively in situations that would otherwise be completely overwhelming. 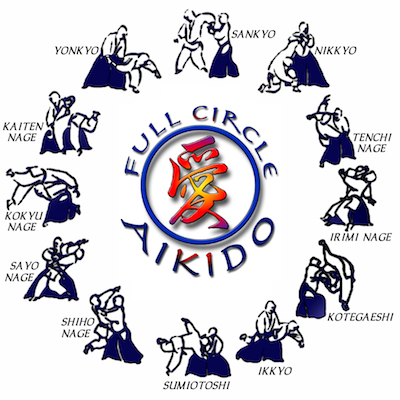 There are no tournaments or tests in Aikido, but there is a noncompetitive ranking procedure called a promotion. Rank (symbolized by colored belts) represents you or your child's commitment and skill in the art and protective techniques of Aikido. For teens and adults who thrive on long term goals, earning you Aikido Shodan (first degree black belt) takes around 500-hours for a typical student. In that time you will become proficient in twelve core moves and hundreds of variations for every conceivable attack as well as a number of related skills such as evasion, rolling, restraining pins, pressure points, weapon disarms, and strategies for multiple attackers. While a black belt is not a magic cloak of confidence, leadership, and love, the personal development and skills to earn one are immensely practical and profoundly powerful. For young adults especially, an Aikido black belt on one's resume or college application is a shining mark of good character, leadership, and self-discipline. Sweats and t-shirt are fine for your first few classes. After that you can purchase a white uniform from the internet or at our dojo ($35 for children, $45 for adults). Always make sure that your uniform is orderly, complete, and clean. Adult and teen students are welcome to start wearing the traditional Japanese culotte anytime prior to black belt. Adults like this $58 hakama in navy or black, or this $79 black hakama with a soft back panel and stronger stitching. Smaller teens do well with this $54 navy or $56 black hakama.